Welcome to NVMe place NVM Non Volatile Memory Express Resources. NVMe place is about Non Volatile Memory (NVM) Express (NVMe) with Industry Trends Perspectives, Tips, Tools, Techniques, Technologies, News and other information. Please note that this NVMe place resources site is independent of the industry trade and promoters group NVM Express, Inc. (e.g. www.nvmexpress.org). NVM Express, Inc. is the sole owner of the NVM Express specifications and trademarks. Image used with permission of NVM Express, Inc.
Visit the NVM Express industry promoters site here to learn more about their members, news, events, product information, software driver downloads, and other useful NVMe resources content. NVMe place includes Non Volatile Memory (NVM) including nand flash, storage class memories (SCM), persistent memories (PM) are storage memory mediums while NVM Express (NVMe) is an interface for accessing NVM. 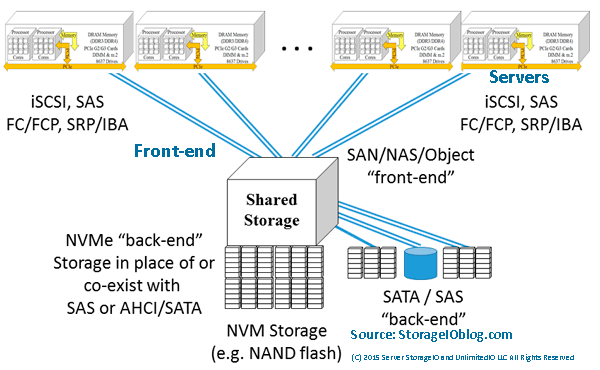 This NVMe resources page is a companion to The SSD Place which has a broader Non Volatile Memory (NVM) focus including flash among other SSD topics. NVMe is a new server storage I/O access method and protocol for fast access to NVM based storage and memory technologies. NVMe is an alternative to existing block based server storage I/O access protocols such as AHCI/SATA and SCSI/SAS devices commonly used for access Hard Disk Drives (HDD) along with SSD among other things. Leveraging the standard PCIe hardware interface, NVMe based devices (that have an NVMe controller) can be accessed via various operating systems (and hypervisors such as VMware ESXi) with both in the box drivers or optional third-party device drivers. Devices that support NVMe can be 2.5″ drive format packaged that use a converged 8637/8639 connector (e.g. PCIe x4) coexisting with SAS and SATA devices as well as being add-in card (AIC) PCIe cards supporting x4, x8 and other implementations. 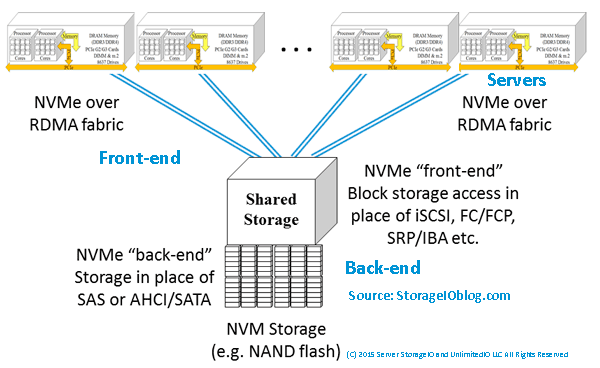 Initially, NVMe is being positioned as a back-end to servers (or storage systems) interface for accessing fast flash and other NVM based devices. NVMe has also been shown to work over low latency, high-speed RDMA based network interfaces including RoCE (RDMA over Converged Ethernet) and InfiniBand (read more here, here and here involving Mangstor, Mellanox and PMC among others). What this means is that like SCSI based SAS which can be both a back-end drive (HDD, SSD, etc) access protocol and interface, NVMe can also being used for back-end can also be used as a front-end of server to storage interface like how Fibre Channel SCSI_Protocol (aka FCP), SCSI based iSCSI, SCSI RDMA Protocol via InfiniBand (among others) are used. The following are some of my tips, articles, blog posts, presentations and other content, along with material from others pertaining to NVMe. Keep in mind that the question should not be if NVMe is in your future, rather when, where, with what, from whom and how much of it will be used as well as how it will be used. How many IOPS can a HDD, HHDD or SSD do (Part I)? Non-Volatile Memory (NVM) Express (NVMe) continues to evolve as a technology for enabling and improving server storage I/O for NVM including nand flash SSD storage. 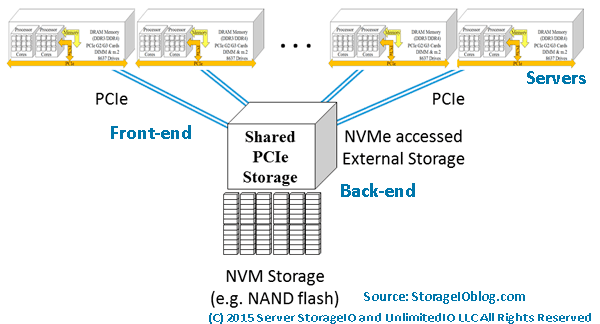 NVMe streamline performance enabling more work to be done (e.g. IOPs), data to be moved (bandwidth) at a lower response time using less CPU. The above figure is a quick look comparing nand flash SSD being accessed via SATA III (6Gbps) on the left and NVMe (x4) on the right. As with any server storage I/O performance comparisons there are many variables and take them with a grain of salt. While IOPs and bandwidth are often discussed, keep in mind that with the new protocol, drivers and device controllers with NVMe that streamline I/O less CPU is needed. Also check out the Server StorageIO companion micro sites landing pages including thessdplace.com (SSD focus), data protection diaries (backup, BC/DR/HA and related topics), cloud and object storage, and server storage I/O performance and benchmarking here. If you are in to the real bits and bytes details such as at device driver level content check out the Linux NVMe reflector forum. The linux-nvme forum is a good source if you are developer to stay up on what is happening in and around device driver and associated topics. Disclaimer: Please note that this site is independent of the industry trade and promoters group NVM Express, Inc. (e.g. www.nvmexpress.org). NVM Express, Inc. is the sole owner of the NVM Express specifications and trademarks. Check out the NVM Express industry promoters site here to learn more about their members, news, events, product information, software driver downloads, and other useful NVMe resources content. Watch for updates with more content, links and NVMe resources to be added here soon.